Brown v. Board of Education 60th anniversary: America’s schools are segregating again. Why American schools are becoming segregated once again. Minority students across the country are more likely to attend majority-minority schools than they were a generation ago. In the popular narrative, this is the beginning of American integration, a process that goes from Rosa Parks to Martin Luther King to the Civil Rights Act and eventually to President Obama. But for as much as we share an integrated culture, millions of Americans—and blacks in particular—live in segregated worlds, a fact illustrated by the persistence and retrenchment of school segregation, as detailed in a new report from the Civil Rights Project at the University of California–Los Angeles. Before considering the report, it’s worth taking a closer look at the process of school desegregation. Almost immediately after Brown, white Southerners met the decision with “massive resistance.” In Virginia, segregationist Democrats pushed sweeping educational changes to combat integration. In 1956, the Commission on Public Education—convened by Gov. Thomas Stanley—asked the General Assembly to repeal compulsory education, empower the governor to close public schools, and provide vouchers to parents to enroll their children in segregated private schools. In the next few years, whites would open “segregation academies” across the state, while closing public schools to block integration. The problem today is that these gains are reversing. As the Civil Rights Project shows, minority students across the country are more likely to attend majority-minority schools than they were a generation ago. The average white student, for instance, attends a school that’s 73 percent white, 8 percent black, 12 percent Latino, and 4 percent Asian-American. 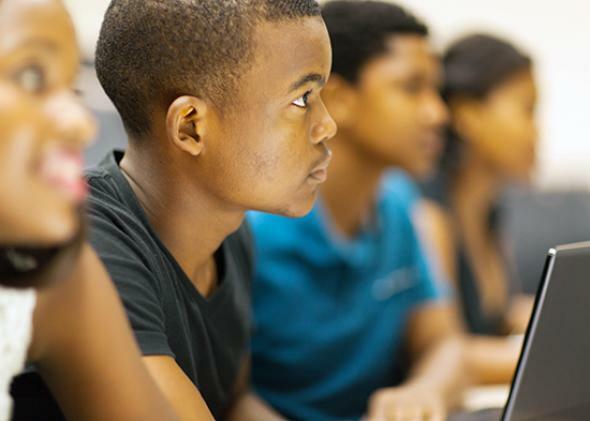 By contrast, the average black student attends a school that’s 49 percent black, 17 percent Latino, 4 percent Asian-American, and 28 percent white. And the average Latino student attends a school that’s 57 percent Latino, 11 percent black, 25 percent white, and 5 percent Asian-American. But this understates the extent to which minority students—and again blacks in particular—attend hyper-segregated schools. In 2011, more than 40 percent of black students attended schools that were 90 percent minority or more. That marks an increase over previous years. In 1991, just 35 percent of black students attended schools with such high levels of segregation. Even more striking is the regional variation. While hyper-segregation has increased across the board, it comes after staggering declines in the South, the “border states”—Delaware, Kentucky, Maryland, and Missouri, i.e., former slaveholding states that never joined the Confederacy—the Midwest, and the West. In the Northeast, however, school segregation has increased, going from 42.7 percent in 1968 to 51.4 percent in 2011. Or, put another way, desegregation never happened in the schools of the urban North. Today in New York, for instance, 64.6 percent of black students attend hyper-segregated schools. In New Jersey, it’s 48.5 percent and in Pennsylvania it’s 46 percent. They’re joined by Illinois (61.3 percent), Maryland (53.1 percent), and Michigan (50.4 percent). And these schools are distinctive in another way: More than half have poverty rates above 90 percent. By contrast, just 1.9 percent of schools serving whites and Asians are similarly impoverished. It’s this poverty and segregation that leads to other, more dramatic problems. As shown in a report from the Journey for Justice Alliance, these schools are understaffed, under-resourced, and most likely to face closure. Indeed, of the schools closed by shrinking budgets and “charter-ization,” the vast majority are in communities of color, even as the geography of school dysfunction includes predominantly white areas. But while we’ve moved backward, Brown wasn’t a failure. For minority students in general, there’s more exposure to each other—and to whites—than there’s been in the past. And for black students in particular, there’s much greater integration in almost every region of the country. “Outside of the Northeast,” notes the Civil Rights Project, “the share of black students in more than 90 percent minority schools remains lower in 2011 than in 1968, even with the reversals of civil rights gains in recent decades.” What’s more, states like Virginia and Louisiana—once at the forefront of opposition to desegregation—are now among the most integrated for black students. Likewise, the highest courts have all but prohibited school districts and elected officials from considering race to balance school enrollments. “The way to stop discrimination on the basis of race is to stop discriminating on the basis of race,” wrote Chief Justice John Roberts in 2007, striking a Seattle plan for racial diversity in its schools. School segregation doesn’t happen by accident; it flows inexorably from housing segregation. If most black Americans live near other blacks and in a level of neighborhood poverty unseen by the vast majority of white Americans, then in the same way, their children attend schools that are poorer and more segregated than anything experienced by their white peers. We could fix this. If the only way to solve the problem of school segregation is to tackle housing, then we could commit to a national assault on concentrated poverty, entrenched segregation, and housing discrimination. We could mirror our decades of suburban investment with equal investment to our cities, with better transportation and more ways for families to find affordable housing. And we could do all of this with an eye toward racism—a recognition of our role in creating the conditions for hyper-segregation. To do this, however, requires a commitment to anti-racism in thought, word, and deed. And given our high national tolerance for racial inequality, I doubt we’ll rise to the challenge.